At Intercon Truck Equipment of Philadelphia and Intercon Truck of Baltimore, we offer just about any service you need along with our regular operations equipping service bodies, dump bodies, plows, spreaders, and more. Whether you want to protect your cargo area or the underbody of your vehicle, or you are looking for repairs to existing equipment we might be the service center you are looking for. Below, you will find a breakdown of the services we offer. Spray-In Bedliners provide the ultimate protection for truck or trailer. The high performance comes from its combination of high physical properties, abrasion resistant, and complete waterproofing. Spray-In bed liners are continuous, monolithic membranes that do not have seams and cannot leak. They are peel, crack, flake or chip resistant – they are bonded to the steel to provide perfect corrosion protection. Spray-In bed-liners also have a unique stipple finish that looks great and prevents cargo from sliding around in the truck bed. Spray-In Bed liners are Durable and Long-lasting. Bed liners permanently bond to truck beds and stand up to impact from rocks, tool boxes, or any other cargo you are hauling. They maintain this toughness in any temperature. Bed-liners will not chalk or quickly fade from the sunlight. If they get a little dull over the years, your nearest dealer can easily rejuvenate them with the application of Gator Gloss. Bed liners look great. Bed liners have a stippled appearance after application that is uniform throughout the entire liner. The stipple effect and the gloss are long lasting and stand up well to exposure to sunlight, keeping your truck looking great for years to come. held in place, and do not bond to the truck bed. This allows water and other debris to get under the liner, causing corrosion and scratches that can damage the truck permanently. The drop-in liners do not serve to prevent cargo from shifting or sliding. Over time, they will warp and crack. get a stippled texture coat that prevents cargo from shifting and sliding around while driving. Finally, the bedliners are UV stable and will not warp, crack, chip or peel. They provide long-lasting good looks and durability. Tectyl protective coatings are formulated in a variety of product films from thin, clear coatings and heavy duty wax, to black bituminous products. The Tectyl products are available in solvent and water based formulations. Waterborne formulations perform in conditions where high solvent content products are not permitted for health and safety reasons. 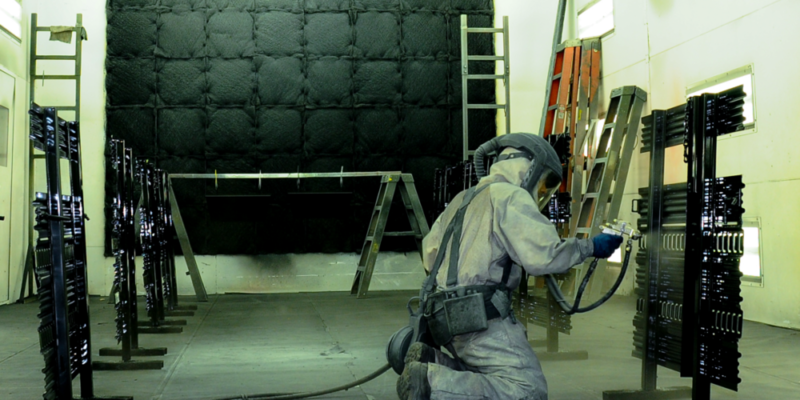 Tectyl protective coatings include a sound dampening product line called V-Damp. V-Damp is a product line of viscoelastic, sprayable liquid sound dampeners with applications in various industries where metal vibrations need to be reduced. Whether it is anti-corrosion or sound dampening, Tectyl protective coatings are globally recognized in industries where proven rust prevention is required. These industries include passenger car OEM, truck and bus OEM, railway, military, spare parts, container, power generation and general industrial metal-working or steel fabricating. Here at Intercon Truck Equipment we offer Tectyl 3344. This is a Black zero VOC, air-dry, waterborne corrosion preventive coating for ferrous and non-ferrous metals. Tectyl 3344 Black is formulated to provide excellent adhesion, hardness and durability to most substrates including primers, e-coat and oily steel; additionally, it’s designed to resist chipping, scratches and gravel marks normally seen on truck and trailer underbodies. Tectyl 3344 can be recoated with most urethane, acrylic or alkyd resin formulated automotive topcoats. 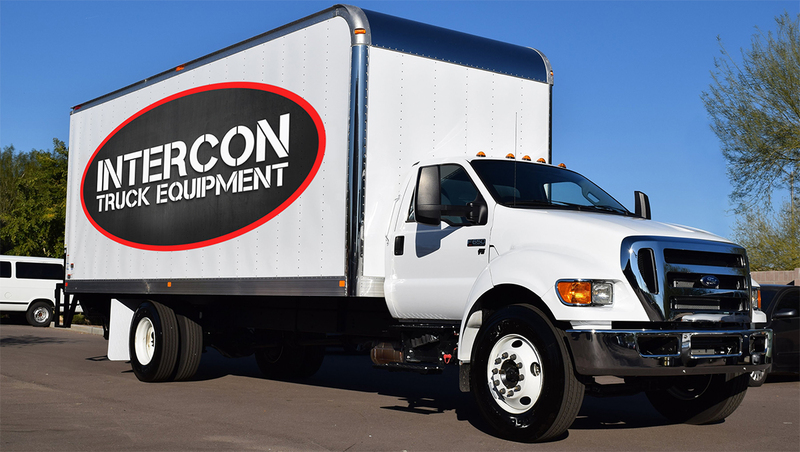 Intercon Truck Equipment uses the highest quality products to ensure your vehicle is the best it can be. At our Maryland location we currently use PPG paint Delfleet Essential. The DELFLEET ESSENTIAL® product portfolio is the value-minded solution for trucks and commercial vehicles. It helps meet your facility’s need for quick turnarounds with consistent quality at an affordable price. Our proven single-stage system is not only easy to mix and spray, it delivers a glossy, durable finish with excellent throughput performance. For added versatility, Delfleet Essential basecoat offers increased color and finish options, while maintaining operational efficiency and superb value. Best yet, both direct gloss and base-clear finishes can be delivered with warranty coverage. Intercon offers unmatched service to our customers with the use of our top of the line commercial paint booth by Global Finishing. GFS provides state-of-the-art finishing equipment for refinishing trucks, vans and other large vehicles. Our truck refinish paint booths utilize the same advance technologies and features of our automotive refinish paint booths, but are designed with more space for larger vehicles. GFS can custom design a booth for your finishing requirements. In addition to paint booths, GFS offers prep environments, aluminum repair stations, mix rooms and accessories to complete your shop. Intercon Truck Equipment is a distributer of high quality hydraulic component manufacturers. A hydraulic hose is specifically designed to convey hydraulic fluid to or among hydraulic components, valves, actuators, and tools. It is typically flexible, often reinforced, and usually constructed with several layers of reinforcement since hydraulic systems frequently operate at high or very high pressures. Hydraulic hoses are used in a variety of industrial hydraulic systems. Dimensions, performance specifications, construction options, and features are important parameters to consider when searching for hydraulic hose. Important dimensions for the selection of hydraulic hose include the inside diameter, outside diameter, and minimum bend radius. Hydraulic hose sizes are denoted by the inside and outside diameter of the hose. The inside diameter refers to the inside of the hose or liner. The outside diameter is often a nominal specification for hoses of corrugated or pleated construction. Minimum bend radius is based on a combination of acceptable hose cross-section deformation and mechanical bending limit of any reinforcement. Construction options for hydraulic hose include reinforced, coiled, corrugated, or convoluted. Reinforced hose is constructed with some element of reinforcement—styles include textile braid, wire braid, wire helix, and other designs in many ply or layer configurations. Coiled hose is coiled for flexibility and elasticity. This feature often makes it expandable and easy to store. Corrugated hose contains corrugations, pleats, or spiral convolutions to increase flexibility and capacity for compression and elongation. Multi-element hydraulic hoses are constructed of more than one hose formed or adhered together in a flat, ribbon, or bundled configuration. Additional features to consider include integral end connections, anti-static, lay flat, crush-proof, flame-resistant, and explosion-proof. For a look at our selection, check out our online store, ITE Parts, for Hydraulic Hose and Fittings by Buyers Products. Alternatively, check out our Hydraulics page, and Hoses/Air Compressors pages here on the Intercon site. Flatbed Trailers – Flatbed trailers are some of the most common types of trailers, and are common mainly because of their versatility. Flatbeds can be utilized for everything from steel coils to lumber. Dry Vans – Dry vans, otherwise known as enclosed trailers, are some of the most common freight containers for shipping cargo on the interstate. Refrigerated Trailers – Refrigerated trailers are primarily dry vans that are insulated and have a cooling system to keep the enclosed goods fresh. Step Deck Trailers – Step deck trailers are remarkably similar to flatbed trailers with the only legal difference being that the maximum freight height is 10 feet. They’re designed to carry things that flatbed trailers can’t. Sidekit Trailers – These trailers are most often equipped with a side of wood paneling and are used to haul loads that aren’t packed, like gravel, dirt and other materials that never need to be packaged. Specialty Trailers – Specialized trailers are built specifically for a type of product to be moved, are usually built to specification, and to haul hazardous materials. For more information on Trailer manufacturers we work with, check out our Trailers & Towing page. Intercon Truck Equipment is proud to offer our customers excellent service for their trucks and truck equipment. We also offer high quality accessories to go with your vehicle including running boards, grille guards, fenders, truck mirrors and much more in our showrooms. Run into our brick and mortar Pennsylvania and Baltimore locations, or head over to our online store, ITEParts.com to shop for your favorite and highest quality accessories for your specific vehicle. “ITE Parts, Intercon Truck Equipment’s online parts store, is determined to surpass your expectations of customer service and buyer security in ways that go above-and-beyond that of a “brick-and-mortar” business. ITE Parts prides itself on its extensive selection and variety by offering over 30,000 products, from a broad selection of vendors; Aries Automotive, Boss Snowplow, Luverne Truck, and Ecco to name a few. With our ever-growing assortment of products we are able to cater to both those who rely on our products for their daily professions, and those who want additional upgrades for a more personal use. Beyond our impressive selection, the team at ITE Parts reflects the same knowledge, dedication, and customer support that many people have come to respect from Intercon Truck Equipment. Removal of the damaged metal can be done with oxy-fuel, plasma cutting or carbon arc gouging. Oxy-fuel and plasma are typically better for cutting through metal, whereas carbon arc gouging is better for gouging out a crack or defect without completely severing the part. Oxy-fuel torches are one of the most common tools for cutting and are found on most service trucks. Plasma cutters, however, produce a smaller kerf (cut width), a smaller heat affected zone (HAZ), and are typically faster than oxy-fuel torches. Plasma cutters also cut through all electrically-conductive metals, whereas oxy-fuel won’t cut through aluminum or stainless steel. Carbon arc gouging is another option when using welding generators with 250 to 500 amps of output and a high duty cycle. This process uses a carbon electrode to melt the defective area, and blast away molten metal with a focused, high-pressure stream of air. Questions? Give us a call and ask for Ron Feehly: our resident Fabrication Foreman, and Expert Welder. These repairs include box trucks, service bodies, dump trucks, flat beds, furniture vans, beverage bodies, refrigerated bodies, armored trucks, step vans, ambulances, construction equipment, and, of course, tractors and trailers of all types and sizes. If you have a request for a material that isn’t on the above list, call us at 1 (410) 679 4900, and we’ll see what we can do. 6′ x 10′ Plasma Table, capable of cutting any shape of part or design after a meticulous drafting process via AutoCAD. We can even use it to cut out company logos to use as a sign! 600-Ton Break, which can form 14-Gauge up to 1/2″ up to 18′ in length. Perfect for the walls of a custom truck body. Intercon Truck Equipment has some of the best fabricators in Maryland, and we take care and caution with each and every task, as if we were doing it for ourselves. Want to learn more? Call us, and ask for Ron Feehley, the Foreman of the Fabrication Division.